St. Joan de Lestonnac was born in Bordeaux, France, in 1556. She married at the age of seventeen. The happy marriage produced four children, but her husband died suddenly in 1597. After her children were raised, she entered the Cistercian monastery at Toulouse. Joan was forced to leave the Cistercians when she became afflicted with poor health. She returned to Bordeaux with the idea of forming a new congregation, and several young girls joined her as novices. They ministered to victims of a plague that struck Bordeaux, and they were determined to counteract the evils of heresy promulgated by Calvinism. Thus was formed the Congregation of the Religious of Notre Dame of Bordeaux. In 1608, Joan and her companions received the religious habit from the Archbishop of Bordeaux. Joan was elected superior in 1610, and many miracles occurred at her tomb. She was canonized in 1949 by Pope Pius XII. 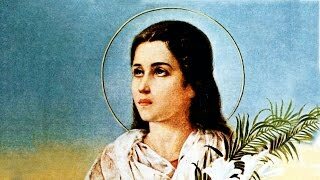 Her feast day is February 2.